If you're familiar with the cyber space then you would have probably heard of controversial nollywood actor, Uche Maduagwu. Uche maduagwu is one actor known for his controversial post and this time around, he decided to take his post to indirectly slam Tonto Dikeh while praising Yemi Alade. Recall all of this is coming after Tonto Dikeh joined a protest to fight against domestic violence a couple of months back. This is so unfair, i don't know why girls don't support each other in this country, honestly, i wanted to insult those girls, but i just had to walk away because i have a busy day ahead. 🏃🚶My question is this, is marriage a trophy? 🏆Is it a must? Or does it have an expiry date? Are people not free to marry whenever they like? Just because a woman is successful in her career doesn't mean she should rush into marriage, those who rushed into marriage some years ago, are they not carrying Domestic Violence Banner on the High way today? 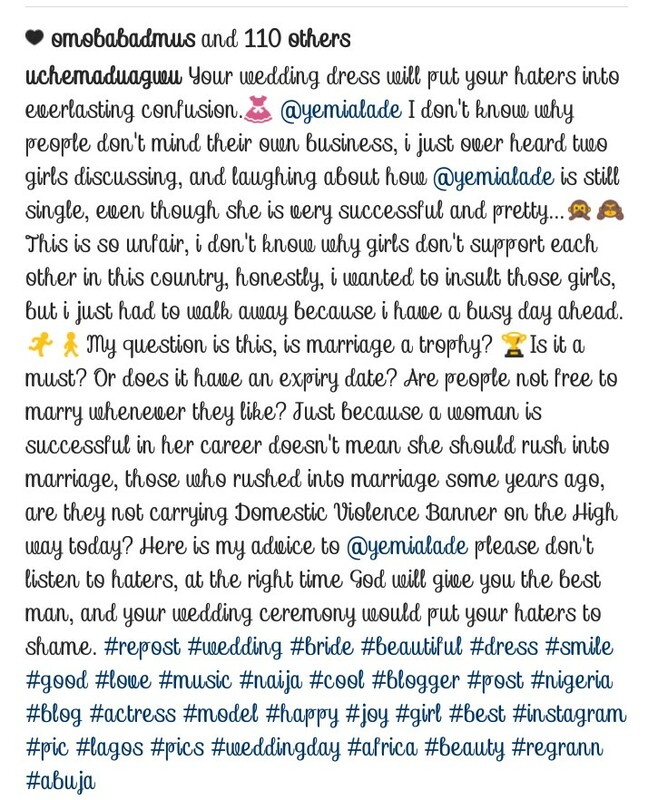 Here is my advice to @yemialadeplease don't listen to haters, at the right time God will give you the best man, and your wedding ceremony would put your haters to shame.